Taxis: Who decided they should be yellow? Why Are There So Many Yellow Taxis in the World? In her new book, ROY G. BIV: An Exceedingly Surprising Book About Color, Jude Stewart startles us into really seeing color again with interesting anecdotes about the hues that surround us. In a series of posts for the Eye, she shares some of these stories. Bumblebee-bright, a yellow taxicab blurs across Times Square: an instantly recognizable and infinitely reproduced symbol of New York City. But New York cab companies weren’t the first to paint their vehicles the now iconic yellow, a popular taxi color in many parts of the country and the world. When businessman Harry N. Allen launched the New York Taxicab Company in 1907, introducing the city’s first fleet of gasoline-powered cabs, his imported French vehicles were equipped with “taximeters” to charge fees based on mileage, manned by drivers dressed like West Point cadets—and originally painted red and green. But this often-told story ignores the fact that yellow taxis had already appeared in various American cities before 1915. Businessman Albert Rockwell was operating a fleet of yellow cabs as early as 1909, and he went on to incorporate the Yellow Taxicab Co. in NYC in 1912. If Hertz chose yellow for scientific reasons, legend has it that Rockwell was merely appeasing his wife Nettie, who preferred the color. 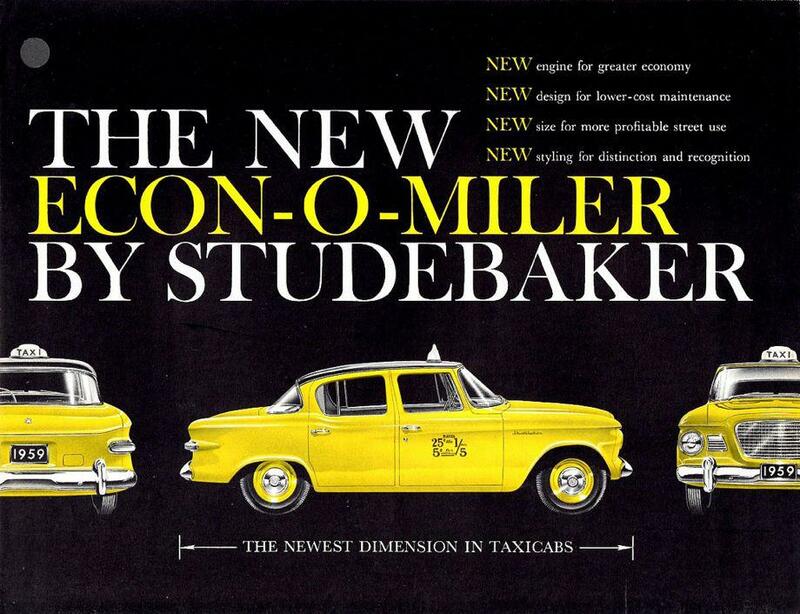 A 1959 Studebaker Econ-O-Miler Taxicab. The wild popularity of gasoline-powered taxicabs lured dozens of competitors into the industry, including Morris Markin’s Checker Taxi, which was based in Chicago, and later Kalamazoo, but whose vehicles were ubiquitous nationwide. Like any madly growing business sector, the taxicab biz was rife with abuses—and the Great Depression only worsened infighting among cabbies desperate for work. The Haas Act of 1937 tried to clean up New York’s taxicab industry by regulating officially licensed cabs under a medallion system. The Haas Act didn’t mandate a specific color of taxicab, but standardizing the cabs’ look to reflect more standardized regulation made sense. With a consistent color and make, “official” taxicabs signal to wary riders that they’re duly regulated by city government. The logic of visual standardization became fully entrenched with a 1967 ruling that all “official” New York taxicabs be painted yellow—specifically “Dupont M6284 or its equivalent,” according to Allan Fromberg of the New York Taxi & Limousine Commission. Any visual swerve therefore indicates either an unlicensed vehicle or an alternate taxicab system.